Just as it is with so many other aspects of life, collaboration is truly a wonderful virtue of blogging. A few weeks ago, I was thinking about food... as I often am. Given my recent obsession, it's no surprise that my mind wandered to pizza. I suddenly had the idea to create a pizza with vodka sauce. Pizza alla vodka, if you will. I had already mentally made the pizza - vodka sauce, mozzarella, parmesan, and spicy Italian sausage. Done and done. 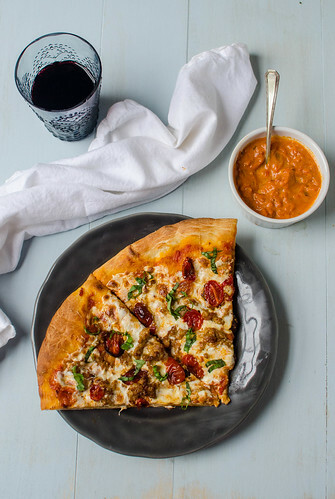 Not even one week later, my pal Annie texted me about this "fancified" margherita pizza, and I immediately fell in love - essentially the same idea, but using roasted tomatoes and no sausage. I couldn't get it out of my head, and I knew I needed to combine our concepts to create the ultimate pizza. I really and truly try not to be over the top about every recipe I post here. Clearly I love them all, because I wouldn't share a recipe if it wasn't successful for me, but being overly effusive about every single dish kind of creates a "boy who cried wolf" image. So with that disclaimer out of the way, let me just tell you that this is without a doubt the best pizza I've ever made. It is so fabulous in fact, that I made it twice in one weekend. I started by making a quick vodka sauce - crushed tomatoes, onion, garlic, red pepper flakes, vodka, and cream. As the oven preheated, I roasted the cherry tomatoes and browned the sausage. Then I slathered the vodka sauce onto the dough, piled on the toppings, crossed my fingers, and threw it in the oven. The combination of pizza dough, roasted tomatoes, melty cheese, and spicy sausage made my house smell absolutely amazing, so I knew we were in for something special. Anywho, I'll finish this up by saying that if you had to choose one recipe from my blog to make, choose this one. And then you can hate me, because it will be nearly impossible to go back to boring old tomato sauce after you eat pizza with vodka sauce. On a rimmed baking sheet, toss the tomatoes with olive oil, salt, and sugar. Turn on the oven to 500 degrees, place a baking stone on the bottom rack, and roast the tomatoes while the oven preheats. Stir them every 5-6 minutes, roasting for 15-20 minutes total, or until they are browned, caramelized, and have released a lot of their liquid. Keep a close eye on them though, because they will burn easily. Remove the tomatoes from the oven and transfer the baking stone to the top rack. Keep the oven on as you prepare the rest of the pizza. Meanwhile, make the vodka sauce. In a medium skillet, melt the butter over medium heat. Add the onion and cook, stirring often, until softened, 5-6 minutes. Stir in the garlic, red pepper flakes, and tomato paste, and cook until fragrant, stirring constantly, about 30 seconds. Pour in the crushed tomatoes, bring to a simmer, and cook until slightly thickened, about 5 minutes. Stir in the vodka and cook an additional 5-8 minutes, remove from heat, and stir in the cream. Season with salt and pepper to taste, and set aside. Remove the sausage from its casings, crumble, and cook in a skillet over medium-high heat until browned and cooked through, 5-6 minutes. Drain off as much fat as you can, and set aside. Sprinkle a large square of parchment paper with cornmeal, and pull and stretch the pizza dough into a 14-inch round. Brush the perimeter with olive oil. Spread 1/2 - 3/4 cup of the vodka sauce over the dough. 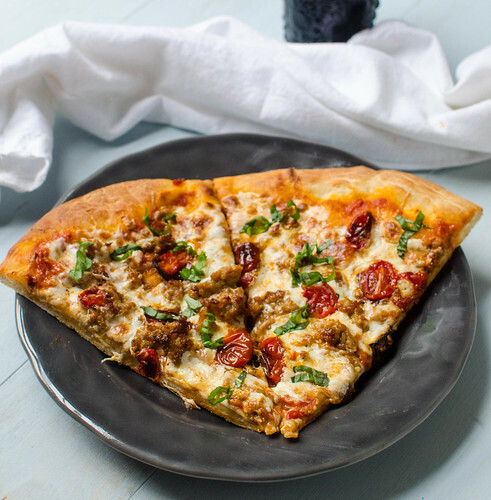 Sprinkle with the mozzarella, followed by the spicy sausage, roasted tomatoes, and finally the parmesan cheese. Carefully transfer the pizza + parchment to the preheated baking stone, and cook 10 minutes, rotating the pizza 180 degrees after 5 minutes. Remove from the oven and allow to cool 10 minutes, sprinkle with the basil, slice, and serve. Pass the extra vodka sauce at the table for dipping. *This does make more vodka sauce than you'll need, so use some of it for dipping, and keep the rest for another pizza or to toss with some pasta later in the week. Oh man - I just finished breakfast and already want this! Can't wait to try it. Well, I guess I know what I'm using that spicy sausage in the freezer for this week. It was going to be for my favorite baked ziti (I'm sure you know the one) but yeah. We need this pizza. Awesome job, Josie! Ha! I already roasted my tomatoes this morning to make Annie's version. I'll have to try it with sausage next time. Looking forward to a tasty dinner! I love how you adapted Annie's pizza to make this! I pretty much swooned overs hers but vodka sauce definitely takes it up a notch! Oh yum, my mouth just watered and stomach is growling. It's only 9 am, is that too early for fresh pizza or is left over pizza only allowed? haha Will have to make this for dinner I suppose. Brilliant...but I'll have to wait a bit to make this until the heatwave of kingdom come is over. I'm drooling just thinking about it. There's a restaurant here that has a vodka pizza that I love, but I haven't been able to recreate their vodka sauce yet. It has soprasetta and lots of fresh basil and is so good. This has inspired me to give it another try soon. Yes, it was awesome!! We're definitely hoping for a great season - go jackets! We had this for dinner last night and my husband cannot stop talking about it! He said it's the best pizza he's ever eaten. Thank you! I think I will try this at our store www.tonyandalbaspizza.com. Maybe mix our award winning pizza sauce with Alfredo and vodka. invented by the original Goodfella's on Hylan Blvd in Staten Island, NY. These guys created it in 1993 and won 2 National Pizza Titles with the Pizza alla Vodka. Try it out!